I just found this picture & realized I never put it up on my blog. It’s a past (2001) housewarming gift for friends. They love the shore and we’ve been on multiple vacations with them – mainly near water (cruise, Wildwood, NJ, Seaside Heights, NJ). With summer here in March, it seemed like a good time to post it! Unfortunately, I did not save any info from this piece. As I recall, it was a stamped canvas with a diagram to follow (mainly backstitch or cross stitch). Threads were included. If anyone knows, I’d love to find out. Postscript: Lisa from my ANG Keystone Chapter saw my posting and actually has this in her stash – it a WIP. She brought it to our meeting Wednesday & it’s coming along nicely! 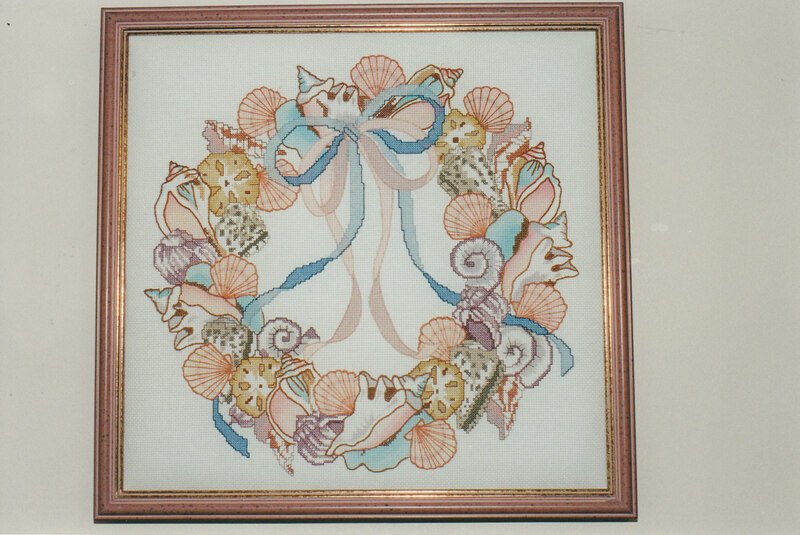 It’s from 1986, called “Seashell Wreath Picture”, and was “NEW!” to have portions of the design printed in color on the Aida cloth (14 count, 14″ x 14″ design area). It’s by Candamar Designs, Inc. who are still around but I didn’t find this vintage piece on their website. Thanks again Lisa for sharing that!! I wonder how that would look in a round frame? It probably could be a nice looking pillow too.